Paramilitaries as Proxies: Declassified evidence on the Colombian army's anti-guerrilla "allies"
Declassified evidence on the Colombian army's anti-guerrilla "allies"
U.S. Listed Colombian President Uribe Among "Important Colombian Narco-Traffickers in 1991"
Then-Senator "Dedicated to Collaboration with the Medellín Cartel at High Government Levels"
Washington D.C. October 16, 2005 - Today, the Colombia Documentation Project proudly announces the first in a series of articles to be published in collaboration with Semana, Colombia's leading news magazine. The column, which will appear monthly on Semana.com, is the result of a mutual desire to publish and disseminate in Colombia declassified information now emerging from United States files about the major issues in the U.S.-Colombia relationship, including the drug war, security assistance programs, human rights and impunity. The first column, published here in English and in Spanish at Semana.com, reveals new information about the hidden history of collaboration between Colombain security forces and their paramilitary allies, offering a unique and intimate perspective on the institutional pressures that encouraged cooperation with paramilitary atrocities. Each month, the National Security Archive will simultaneously publish an English-language version of the article along with scanned images of the documents cited in the column. Watch this space for upcoming articles or sign up to receive the National Security Archive's free email update every time the website is updated with new material. The question of the Colombian military's complicity with paramilitary atrocities will probably not be addressed by the National Commission on Reparation and Reconciliation, which convened last week to sort through the legal and compensatory issues involved in the deactivation of the country's right-wing militias. The law governing the demobilization process provides sweeping amnesty for most paramilitary members and requires little more than good faith and modest reparations payments from those guilty of more serious "crimes against humanity." The Justice and Peace Unit of the Attorney General's office-which operates alongside the commission-has only 60 days to prepare cases, and even those found guilty of serious charges can expect to serve relatively light sentences. The measure also does not compel paramilitary commanders to provide information about the operations and financing of their organizations-what President Álvaro Uribe calls "a balance between justice and peace." Fortunately, recently declassified U.S. documents, including the first-hand accounts of senior Colombian army officers, are beginning to lift the veil of secrecy. Obtained under the U.S. Freedom of Information Act by the National Security Archive, these records provide important new details about military involvement in paramilitary attacks and offer a unique and intimate perspective on the institutional pressures that encouraged a wide range of cooperation with paramilitary forces-from the tacit acquiescence of senior commanders to the direct participation of field officers and their troops. One case sure to be examined by the commission concerns the infamous series of paramilitary massacres in and around the towns of La Gabarra and Tibú in the summer of 1999. Paramilitaries from the United Self-Defense Forces of Colombia (AUC) moved into the lucrative coca growing region in May 1999 to "cleanse" guerrilla influence from the area, killing some 150 people in more than a dozen attacks over that next three months. In most cases, local military forces simply did not react to the paramilitary incursions. In the midst of this brutal offensive, the Colombian vice president's office "privately reported" to the U.S. embassy that Colombian army soldiers "had donned AUC armbands and participated directly" in one of the massacres. "The string of mass killings since May without security force response is appalling," U.S. Ambassador Curtis Kamman reported in a cable to Washington. "How did seven massacres occur without interference under the noses of several hundred security force members?" "Look, I have 100 kilometers of oil pipeline to protect, as well as several bridges and the National Police… Plus, there are guerrillas to fight… If you have so many tasks to do with so few resources, and you're faced with two illegal armed groups, one of which (guerrillas) is shooting at you and the other (paramilitaries) is shooting at them, you obviously fight the guerrillas first, then worry about paramilitaries." "The local army unit refuses to combat area paramilitaries," the embassy officer wrote in his trip report. "He is convinced that doing so before the guerrillas are defeated would not make military sense." The colonel's acquiescent approach to paramilitarism should not have surprised anyone at the embassy. Other documents said much the same. "All indications are that paramilitarism has continued to grow…and the government has done little to confront them," the State Department's Andean desk officer reported in January 1999. "Security forces did not intervene during 19 separate attacks in which 143 civilians were killed over four days in January." In February, a U.S. military official said that security forces had "not actively persecuted" the paramilitaries because they saw them as "allies in the fight against guerrillas, their common enemy." The CIA's Senior Executive Intelligence Brief for September 16, 1999 offered a similarly bleak assessment, finding that local military commanders "do not challenge paramilitary groups operating in their areas because they see the insurgents as the common foe." Under pressure to clean up its human rights record and humbled by an increasingly effective guerrilla force, the Colombian military had begun to shift more and more of its dirty work to paramilitary groups. Thus, even as military violations declined, a State Department report titled "Colombia: A Violent Backdrop" found that "the military's frustration with its inability to defeat the guerrillas has contributed to a jump in paramilitary violations." The result was "decreased military aggressiveness in the field, and at least tacit support for paramilitaries, which liquidate suspected guerrillas and sympathizers without legal concerns." The documents describe a firmly entrenched pattern of abuse in the Colombian military, less a specific policy than an institutional culture. A "cashiered" colonel from the Colombian army's notorious 17th Brigade confided to a U.S. military attaché that there was a "body count syndrome" among army forces that tended "to fuel human rights abuses by otherwise well-meaning soldiers trying to get their quota to impress superiors." That mindset had produced what the official characterized as "a cavalier, or at least passive, approach" among military officers when it came to "allowing paramilitaries to serve as proxies for the Colar [Colombian army] in contributing to the guerrilla body count." Cooperation with paramilitary groups was implied, according to the colonel. Abuses were tacitly condoned by the expectations of senior military leaders who sheltered themselves behind a wall of plausible deniability. Former Fourth Brigade commanders Harold Bedoya and Jorge Enrique Mora "looked the other way," he said, and "never allowed themselves to become directly involved in encouraging or supporting paramilitary activities." The once (Bedoya) and future (Mora) armed forces commanders simply "turned their backs to what was happening and felt the Colar [Colombian army] should in no way be blamed for any resulting human rights atrocities committed." The generals just might get their wish. 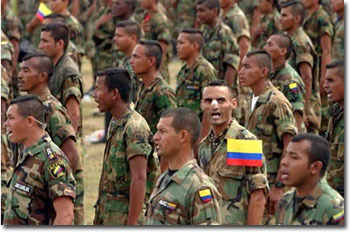 The lenient terms of surrender and the strict time limit imposed on investigations of paramilitary crimes ensure that they will uncover little new information on the critical role that Colombian military officers have played in fomenting the groups, thwarting what might otherwise have been an opportunity to use the demobilization process to gather valuable information on the underpinnings of paramilitarism in Colombia. Unless an effort is made to explore this history of collaboration, it is unlikely that Colombians will know either justice or peace. Defense Intelligence Agency, Intelligence Information Report, Secret, 4 pp. There is a "body count syndrome" in the Colombian army's counterinsurgency strategy that "tends to fuel human rights abuses by otherwise well-meaning soldiers trying to get their quota to impress superiors," according to a recently-retired Colombian army colonel and reported in this Intelligence Information Report. This approach is in part responsible for commanders "allowing the paramilitaries to serve as proxies for the [Colombian army] in contributing to the guerrilla body count." The 17th Brigade in Urabá had been cooperating with paramilitaries "for a number of years," according to the colonel, but it "had gotten much worse" under the command of Gen. Rito Alejo del Río Rojas, who was later indicted but ultimately acquitted of collusion with paramilitaries by the Prosecutor General's office in May 2003. The officer was also critical of several high-level military commanders, including Gen. Jorge Enrique Mora, who would later serve as armed forces commander. Mora had a clean public reputation, according to the officer, but was "probably was one of those who looked the other way" with respect to collaboration with paramilitaries. Former armed forces commander Gen. Harold Bedoya "fell into the same category," in that both officers "never allowed themselves to become directly involved in encouraging or supporting paramilitary activities, but they turned their backs to what was happening and felt the [Colombian army] should in no way be blamed for any resulting human rights atrocities committed." The colonel is also concerned about "the potential direction" of the Colombian army if another general, Iván Ramírez Quintero, abuses his new position as army inspector general. The officer is convinced that Ramírez "has gone far beyond the passive phase with paramilitaries and is actively supporting them." Ramírez, the so-called "godfather of Colombian army intelligence" who later admitted to having a close working relationship with the CIA, had his U.S. visa revoked in 1998 and was then named as Colombia's military attaché to Chile. State Department, Bureau of Intelligence and Research, Intelligence Assessment, Confidential, 4 pp. Colombia's conflict is at a "strategic stalemate," according to this State Department intelligence analysis. Persistently high levels of violence and human rights violations are likely to expand "in the face of military ineffectiveness." WHile the military's record may have improved on paper, in practice many Colombian military officers "turn a blind eye to paramilitary activities in their areas of responsibility." Frustration with the inability to effectively confront the guerrillas "has contributed to a jump in paramilitary violations,…decreased military aggressiveness in the field, and at least tacit support for paramilitaries, which liquidate suspected guerrillas and sympathizers without legal concerns." State Department cable, Confidential, 3 pp. In a brief summary for Ambassador Curtis Kamman, State Department officials Phil Chicola (Office of Andean Affairs) and Leslie Gerson (Bureau for Democracy, Human Rights and Labor) provide their "view of the military/paramilitary situation in Colombia." While much of the document has been excised, it is clear that they are concerned about "the appointment to key positions" of generals credibly accused of ties with paramilitaries, including generals Fernando Millán, Rito Alejo del Río, and Rafael Hernández López. "All indications," they conclude, "are that paramilitarism has continued to grow during the Pastrana administration." They add that the government has done little to confront paramilitaries, citing reports that "state security forces did not intervene during 19 separate attacks in which 143 civilians were killed over four days in January." This brief and heavily-censored analysis of Colombian guerrilla and paramilitary groups-U.S. military intelligence sources finds that Colombian security forces "have not actively persecuted paramilitary group members because they see them as allies in the fight against the guerrillas, their common enemy." U.S. Embassy Bogotá, cable, classification excised, 5 pp. In the midst of a series of brutal paramilitary massacres in and around the towns of La Gabarra and Tibú in the summer of 1999, the Colombian vice president's office "privately reported" to the U.S. embassy that Colombian army soldiers "had donned AUC armbands and participated directly" in one of the massacres. AUC forces moved into the lucrative coca growing region in May 1999 to "cleanse" guerrilla influence in the area, killing some 150 people in more than a dozen attacks over that next three months. In most cases, local military forces simply did not react to the paramilitary incursions. "The string of mass killings since May without security force response is appalling," U.S. Ambassador Curtis Kamman reports in this cable to Washington. "How did seven massacres occur without interference under the noses of several hundred security force members?" CIA, Senior Executive Intelligence Brief, Top Secret, 3 pp. The CIA's daily Senior Executive Intelligence Brief finds that local Colombian military commanders "do not challenge paramilitary groups operating in their areas because they see the insurgents as the common foe." U.S. Embassy Bogotá, cable, Confidential, 10 pp. "Look, I have 100 kilometers of oil pipeline to protect, as well as several bridges and the National Police… Plus, there are guerrillas to fight… If you have so many tasks to do with so few resources, and you're faced with two illegal armed groups, one of which (guerrillas) is shooting at you and the other (paramilitaries) is shooting at them, you obviously fight the guerrillas first, then worry about the paramilitaries." The visit followed a series of some 15 paramilitary massacres in and around the Norte de Santander towns of La Gabarra and Tibú during May-September 1999 that left as many as 145 dead. At the time, Matamoros was under investigation by the Prosecutor General's Human Rights Unit for organizing paramilitary groups from 1997-1999 and specifically in connection to the La Gabarra massacres. He was later absolved of these charges. "Matamoros was surprisingly frank with [the U.S. Embassy official] about his intention not to fight paramilitaries," according to the document. "He is convinced that doing so before the guerrillas are defeated would not make military sense."